Soon after the introduction of virtual and dynamic wedges, the use of conventional physical hard wedges (primarily used for the dose in-homogeneity compensation) became obsolete in many institutions during the first decade of this century. The dynamic wedges offer wedge factor as unity, thereby improving efficacy of the treatment delivery keeping the monitor unit constant. However, they have limitations on minimum monitor unit setting and require collimator rotation (±90°) to achieve the desired dose distribution. The latter has an effect on beam shaping leading to the lack of target conformity due to parallel alignment of multileaf collimators (MLCs) with respect to the target length. The partially blocked MLC subfields referred to as field-in-field (FinF) within the primary open fields enable the physicist to compute complex treatment plans without using physical or dynamic wedges. The FinFs help achieve rapid dose fall off in the vicinity of the hotspot without actually affecting the global dose distribution. Furthermore, the substantial development in the MLC system and MLC-based planning techniques has helped improve the dose homogeneity of the treatment plan and delivery. While several investigations have been reported in this aspect, the primary focus lies only on intact breast radiotherapy and only a few reports deal with postmastectomy radiotherapy (PMRT)., The early reports on intact breast irradiation techniques such as intensity-modulated radiation therapy (IMRT) and multisegmented MLC-based treatment plans ,,,, are an evidence for the same. IMRT generates rapidly varying fluence for static targets and requires additional information to account for respiratory motion and displacement of dose gradients during treatment. Further, the complex anatomical geometry of the chest wall (CW) makes IMRT technique non-standard that leads to a majority of the physicians to prefer opposed tangent fields or respiratory-gated radiotherapy. In addition, IMRT produces more damage to normal tissue than the FinF technique in breast treatments. The incorporation of IMRT beams into the conventional tangential plan (hybrid-IMRT) was also reported by Mayo et al. for intact breast irradiation. 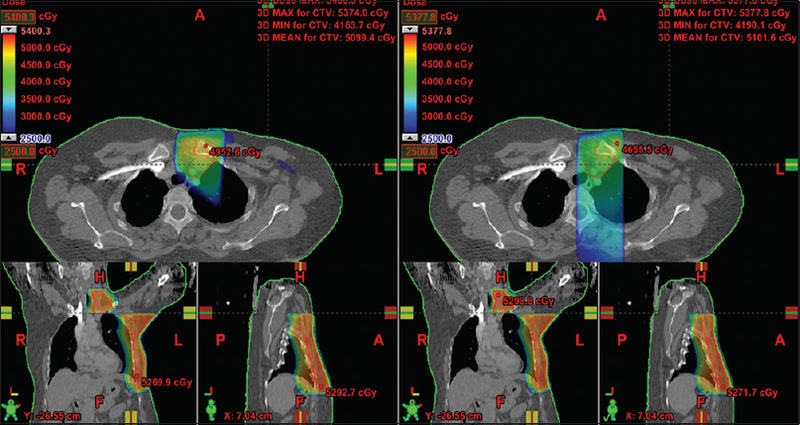 Several investigators reported the results of dosimetric comparisons of forward IMRT (or FinF) with wedged (physical and dynamic wedge) beams and electronic compensator techniques.,,, At present, the FinF is a widely accepted technique for breast radiotherapy. However, very few reports on PMRT with nodal region have been reported in literature. To the best of our knowledge, there are no published data that deal with fluence verification for dynamic FinF portals. In the present study, we have demonstrated a new approach of using solitary dynamic portal (SDP) in monocentric conformal plans for PMRT with nodal region and fluence verification using amorphous silicon-based electronic portal imaging device (a-Si EPID). The patients were positioned with both arms above the head and immobilized using breast board with headrest and armrest. The planning computed tomography (CT) images were acquired using Biograph TruePoint HD CT (Siemens Medical Systems, Germany) with a slice thickness of 5 mm and a maximum field of view of 700 mm from the level of “C2” to “start of adrenals.” The field borders, scar, and contralateral breast were clinically marked with radiopaque wires. The target (CW and nodal volumes) and organ at risks (OARs) were delineated according to the guidelines given in the Radiation Therapy Oncology Group (RTOG) breast cancer Atlas More Details for radiation therapy planning using Eclipse treatment planning system (TPS) (Varian Medical Systems, Palo Alto, CA, USA). In this study, treatment plans of 24 patients who underwent surgical mastectomy followed by PMRT with nodal regions were analyzed. Among these, 14 patients were treated with CW with supraclavicular (SC) node and 10 patients with CW, SC node and three levels of axillary node (AX) involvement were analyzed. The monocentric conformal plans with SDP were generated in Eclipse TPS and delivered using Clinac 2100C/D dual energy (6 and 15 MV) linear accelerator equipped with 120-leaf Millennium tertiary MLC, on-board imager, and an a-Si EPID (Varian Medical Systems, Palo Alto, CA). For all the cases, conventional dose regimen of 50 Gy to CW, SC, and AX in 25 fractions (5 weeks) was used. (i) At first, conformal opposing tangents (medial and lateral) fitted to the beam's-eye-view (BEV) of CW with an optimum gantry angle, and one direct anterior portal (gantry 0°) fitted to BEV of SC was added in the treatment plan. In addition, a subfield was added to the lateral tangent fitted to BEV of entire target volume (CW and SC) and sharing ≤0.5 of its relative weight (considering the reference beam weight as 1). Before incorporation of the FinFs, optimum beam weight was chosen as listed in [Table 1]. Finally, FinFs (10–15 fields) were added only in the medial tangent that were refitted to BEV of entire target volume (CW and SC) and shared about 30%–50% beam weight of medial tangent, thereby increasing the tumor dose in the SC region while reducing the dose above and below the direct anterior portal. These multiple lower weight (3%–5% relative weight per field) irregular FinFs were then converted into a dynamic field referred to as “SDP.” This approach reduces the unnecessary dose to the lungs and healthy tissues across the SC region which is often the problem encountered in the case of the conventional direct anterior portal. To increase the target dose conformity and reduce the heart dose, lower weight tilted anterior and posterior fields with angle “θ” (ranging from 20° to 40° tilt with respect to the tangents) referred to as “control fields” were added in the treatment plan. However, optimum field weights were chosen for the control fields to alter the higher isodose without affecting the ideal tangential distribution. The BEVs of the proposed conformal plan with SDP of one patient with left-sided CW with SC node (CS) are illustrated in [Figure 1]. To attain better surface dose and deeper depth dose, 6 MV photon beam with 5 mm bolus was added to CW and direct anterior 15 MV photon beam used for nodal regions (SC or SC and AX), respectively. The isocenter was placed superiorly three-fourth of the length of the entire target to overcome divergence effect [Figure 1]. In addition, field border matching was performed to avoid overdose at the field junction. On the other hand, dose deficit (or cold spot) at the junction due to field matching was overcome using lower weight [Table 1] solitary dynamic FinF portals. [Figure 2] shows the schematic of conformal plan with SDP. (ii) For CW with SC and AX (CSA) irradiation, two planning volumes were created, namely (a) CW and AX and (b) SC and AX. Similar beam arrangement and weighting strategies were followed. In our study, key parameters such as the dose distribution, dose volume histogram (DVH), tumor dose conformity index (TDCI), and tumor dose homogeneity index (TDHI) were evaluated. The dose distribution was evaluated by analyzing the target dose coverage with V95%, V105%, and V107% (the volume of target receiving 95%, 105%, and 107% of the prescription dose, respectively), healthy tissue dose, and ipsilateral lung dose spread (20 Gy and 30 Gy dose corresponding to 40% and 60% of prescription dose). TDCI and TDHI are two independent dosimetric tools which characterize the dose uniformity within the target volume and portray the degree to which the prescription dose conforms the target. Since several approaches for reporting the TDCI and TDHI have been published, the international commission on radiation units and measurements recommendation given below was primarily used in this study to evaluate the treatment plans. where PIV stands for prescription isodose volume and TV stands for target volume (generally planning target volume). where D2% and D98% represent the dose data extracted from the cumulative DVH for 2% and 98% of the target volume and referred as target maximum and minimum dose., To evaluate the OAR doses, various dose volume parameters (DVPs) were analyzed. For all the plans, the volume of lung (ipsilateral and combined lung) receiving 5 Gy (V5), 20 Gy (V20), and 30 Gy (V30) and mean lung dose (Dmean) were analyzed. To evaluate the cardiac dose for the LCS and LCSA plans, volume of heart receiving 25 Gy (V25) and 30 Gy (V30) and Dmean were determined. Furthermore, the V5 and Dmean data for contralateral lung and breast volumes were also evaluated. The portal dose image prediction (PDIP) algorithm is a separate module with its own kernel specifically calculated for the a-Si EPID. The EPID mounted on the linear accelerator with robotic exact-arm has a 40 cm × 30 cm sensitive area corresponding to an active matrix of 1024 × 768 pixels. The predicted fluence map of SDP at the level of EPID at 105 cm source to detector distance (SDD) was generated using PDIP algorithm. The portal images of delivered fluence maps were acquired in air with EPID at same SDD using image acquisition software 3 (version 7.5) and image detection unit-20. The gamma (γ) evaluation technique was used for quantitative comparison of the measured and predicted fluence maps with standard γ criteria of 3% dose difference (DD) and 3 mm distance to agreement (DTA) using Portal Dosimetry software (Varian Medical Systems, Inc., USA). The isodose distributions of the hybrid conformal plan with SDP were analyzed in different planes of the planning CT images. [Figure 3] shows the isodose distribution of a treatment plan with SDP (left) and a typical three-dimensional conformal plan (right) with two independent isocenters for CW and SC. [Table 2] shows the target DVPs and quality parameters of hybrid conformal plans with SDP for both CS and CSA plans, respectively. 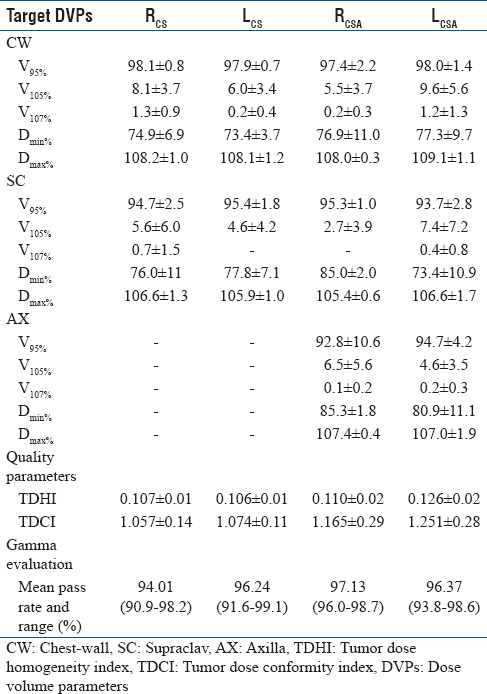 Similarly, the target DVP data of summed doses of CW and regional nodes (SC or SC and AX) computed with typical tangential conformal plans with dynamic wedges and direct anterior field (with gantry 10°), respectively are given in [Table 3]. Our results showed remarkable dose coverage (V95) and relatively lesser high-dose region (V105 and V107) and target maximum dose (Dmax) along with higher degree of TDHI and TDCI for both CS and CSA plans. To avoid the underdosing (coldspot) at CW-SC junction, field matching was performed, and lower weight FinFs were also incorporated at field junction. [Figure 4] shows the dose distribution of LCS treatment plan with SDP and dual isocenter conformal plan at the field borders. Incorporation of SDP in the conformal treatment plan effectively reduced the low-dose spread to the ipsilateral lung without affecting the homogenous dose distribution across the target volume. 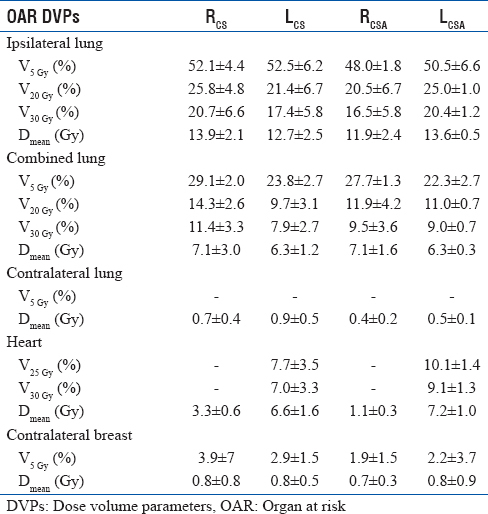 [Table 4] shows lung (ipsilateral, combined, and contralateral lung volumes), heart, and contralateral breast DVPs obtained from the hybrid conformal plans with SDP. Similarly, the OAR data of summed doses of typical tangential conformal plans are given in [Table 5]. To evaluate the heart dose of treatment plan with SDP, three different DVPs, namely, V25, V30, and Dmean were used [Table 4]. V25 of heart was recorded in our study for LCS and LCSA plans ranging from 3.5% to 10.3% and 7.9% to 11.4%, respectively, and mean of 7.7% ± 3.5% and 10.1% ± 1.4% overall. Incorporation of control fields in the treatment plan reduces the dose at the level of heart which is a common problem encountered in tangential radiotherapy [Table 5]. Since majority of the dose contributions are from static tangent portals, the dose to contralateral lung and breast was comparable to the typical tangential conformal plans [Table 4] and [Table 5]. In our study, we have demonstrated fluence verification for the SDP fields of all the 24 cases using EPID and portal dosimetry software. [Figure 5] shows the γ evaluation of predicted and measured fluence map of SDP field in portal dosimetry software. All the measured fluences are in good agreement with corresponding predicted fluence maps in the γ evaluation. More than 95% of pixels in the dose matrices of the two target CS plans passed standard 3% and 3 mm DD and DTA γ criteria. Similarly, for the three target CSA plans, >96% pass rate was recorded for the same criteria which are listed in [Table 2]. Thin ends of the wedge in conventional beams and the rapidly varying fluences for moving target in IMRT could lead to higher degree of hotspots in the former and delivery uncertainties in the latter, respectively. Several dosimetric alternatives to overcome the above have been extensively studied in the last decade,,,,,,, among which, multisegmented MLC or FinF and hybrid-IMRT techniques were widely accepted for breast radiotherapy., However, these reports mainly focused on intact breast irradiations. 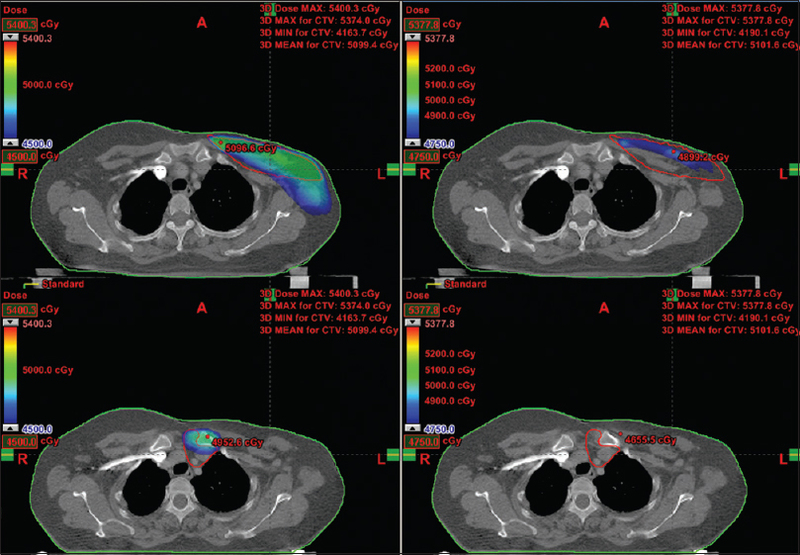 Computing an optimum treatment plan for PMRT with nodal regions is a complex task due to the anatomical geometry of CW and the respiratory motions when compared to intact breast radiotherapy. Although a recent report by Wang et al. suggests that the 4-field IMRT is an appropriate compromise for the treatment of PMRT, majority of the reports support FinF technique for breast irradiation.,,,, Due to CW motion and the requirement of additional resources in planning and pretreatment plan verifications, IMRT is not recommended for the breast radiotherapy., In the present study, we have demonstrated an alternative way of conformal treatment planning technique for mastectomy CW with regional nodes with SDP and EPID-based fluence verification. While the conformal plan with SDP was primarily evaluated for the PMRT with SC node irradiation, it was also later evaluated for SC with three levels of AX node irradiation. All the treatment plans with SDP showed superior target coverage and excellent dose uniformity for both CS and CSA plans. The mean V95, V105, and V107 of CS plans were found to be 96%, 6.1%, and 0.4%, respectively. Similar data for the target volume (95%, 6.5%, and 0.5%) were also obtained in CSA plans. Incorporation of SDP in the treatment plan enables the dose homogeneity to be maintained within the entire target volume while reducing the dose to the normal tissue surrounding the SC region, especially at the level of the skin and lung on the ipsilateral side. 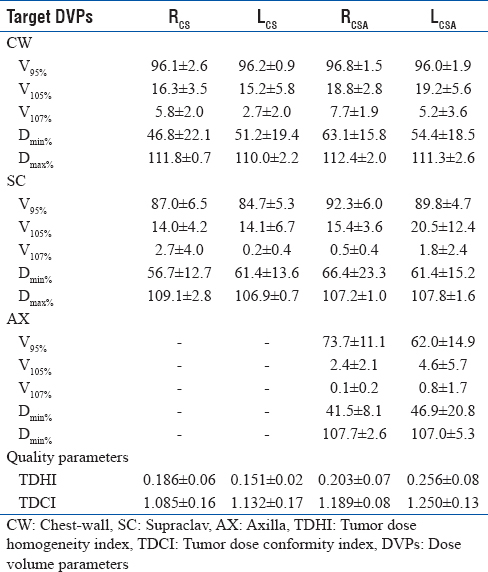 The mean V95 of LCS and LCSA plans was found to be 96.5%, similar to that reported by Wang et al., however, with a smaller TDHImean (0.116 ± 0.02) as reported in [Table 6]. In addition, the treatment plans with SDP were found to have very less V107; ≤0.5% ± 0.8% with V110; and 0% for all the cases while Wang et al. reported V110, 2.5%, thereby demonstrating a superior plan quality with SDP. Further, the dosimetric data for target volume reported in our study were comparable with that of the forward planned tangential IMRT plans reported by Morganti et al. However, V107, 3.1% ± 4% reported in their study with SC nodal irradiation (for thirty patients) was higher than that reported in our study for both SC and SC and AX nodal irradiation, namely V107, ≤0.5% ± 0.8%. We have also reported lower V107, TDHI, and TDCI without compromising on the OAR sparing when compared to Ma et al., [Table 6] and [Table 7] who reported the dosimetric feasibility of IMRT for PMRT with regional nodes. Moreover, the V30 and Dmean of heart, V20 and Dmean of ipsilateral lung, and V5 and Dmean of contralateral lung reported in our study were also less than those reported by them. The central tendency of the dosimetric results of our treatment plans with SDP showed ideal DVH data for lung [Table 4] that was well within the breast OAR constraints overall. Treatment plans with SDP effectively reduce the V5 to the contralateral breast and lung that is a common limitation of multibeam IMRT plans. In our study, whereas V5 for contralateral breast was very low (3.4% ± 5.0% in CS and 2.1% ± 3.1% in CSA plans), it was found to be nonexistent for contralateral lung [Table 4]. The V5 was suppressed by higher weight of tangential beams resulting in a higher degree of control over the low-dose spread even with the introduction of lower weight non-tangential control fields. In general, volume delineation protocols, specific OAR constraints, and expertise of the planner directly affect the plan dosimetry in forward planning. To attain uniform plan dosimetry, we strongly recommend fixed acquisition protocols, RTOG contouring guidelines, specific portal arrangement, and weighting strategies demonstrated in our study. Conformal plans with SDP offer higher weight tangential static portals for CW with adequate margin for respiratory motion and a direct anterior portal for the nodal region to eradicate the geometric uncertainties while enabling faster dose delivery (in the order of 4–7 min including gantry rotation excluding patient setup and imaging). Further, the SDP fluence map computed in the Eclipse TPS is less complex than IMRT portals, having lower MU in the order of 45–60. In the present study, we have successfully incorporated fluence verification of the solitary dynamic FinF portal that is often ignored as per available literature. The fluence verification was performed by acquiring portal images of the dynamic field using a high-resolution a-Si EPID which does not require an elaborate setup for portal image acquisition  and separate module for γ analysis. According to Son et al., γ-evaluation yielding 95% pass rate for 3%/3 mm DD/DTA criteria was acceptable in quality assurance. Thus, high pass rate (>95%) of dose pixels in the evaluated fluence map showed that the SDP field introduced to achieve homogenous target coverage, especially at the field junction (while sparing the healthy tissue dose), could be accurately delivered and easily put into practice for PMRT with nodal regions. From our results, we conclude that the hybrid conformal plans with SDP would be a suitable treatment option for complex mastectomy CW with regional nodal irradiation. The use of conformal static field arrangements with solitary dynamic field would facilitate improved dose distribution and reduced uncertainty in delivery. 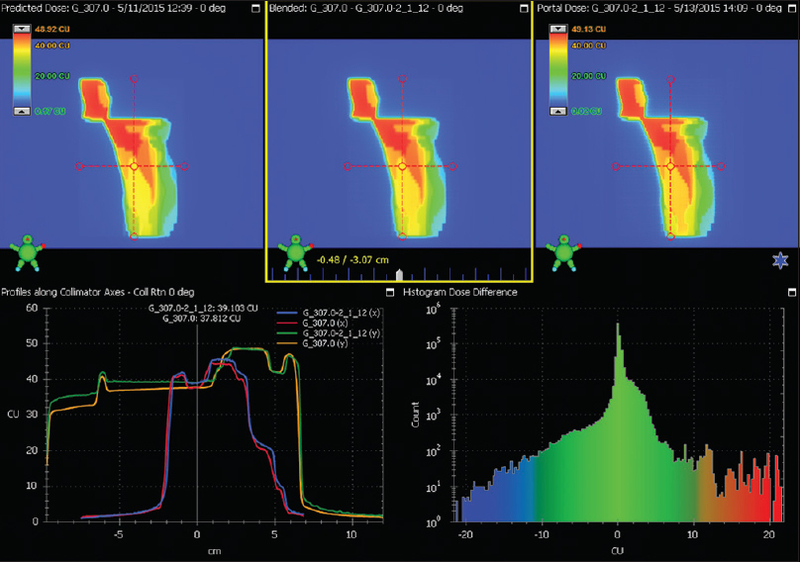 The future scope of this study is to adapt deep inspiration breath-hold technique while delivering the dynamic portal to avoid displacement of dose gradients and thereby enabling higher degree of dose homogeneity across the moving target. Authors would like to thank Ms. Susan K Abraham, Medical Physicist and Ms. Benedicta Pearlin, Medical Physics intern, Department of Radiotherapy, Christian Medical College, Vellore, India, for their help in data collection. Fontanarosa D, Orlandini LC, Andriani I, Bernardi L. Commissioning varian enhanced dynamic wedge in the PINNACLE treatment planning system using Gafchromic EBT film. Med Phys 2009;36:4504-10. Ma J, Li J, Xie J, Chen J, Zhu C, Cai G, et al. Post mastectomy linac IMRT irradiation of chest wall and regional nodes: Dosimetry data and acute toxicities. Radiat Oncol 2013;8:81. Wang J, Li X, Deng Q, Xia B, Wu S, Liu J, et al. Postoperative radiotherapy following mastectomy for patients with left-sided breast cancer: A comparative dosimetric study. Med Dosim 2015;40:190-4. Hong L, Hunt M, Chui C, Spirou S, Forster K, Lee H, et al. Intensity-modulated tangential beam irradiation of the intact breast. Int J Radiat Oncol Biol Phys 1999;44:1155-64. Gulybán A, Kovács P, Sebestyén Z, Farkas R, Csere T, Karácsonyi G, et al. Multisegmented tangential breast fields: A rational way to treat breast cancer. Strahlenther Onkol 2008;184:262-9. Lohr F, El-Haddad M, Dobler B, Grau R, Wertz HJ, Kraus-Tiefenbacher U, et al. Potential effect of robust and simple IMRT approach for left-sided breast cancer on cardiac mortality. Int J Radiat Oncol Biol Phys 2009;74:73-80. Ha B, Suh HS, Lee J, Lee KJ, Lee R, Moon BI, et al. Long-term results of forward intensity-modulated radiation therapy for patients with early-stage breast cancer. Radiat Oncol J 2013;31:191-8. Giraud P, Houle A. Respiratory gating for radiotherapy: Main technical aspects and clinical benefits. ISRN Pulmonol 2013;2013:1-13. Ai H, Zhang H. SU-E-T-272: Radiation damage comparison between intensity modulated radiotherapy and field-in-field technique in breast cancer treatments. Med Phys 2014;41:286. Huang XB, Jiang GL, Chen JY, Chen LF, Hu WG. Dosimetric evaluation of intensity-modulated tangential beam versus conventional tangential irradiation for breast cancer. Ai Zheng 2006;25:855-60. Herrick JS, Neill CJ, Rosser PF. 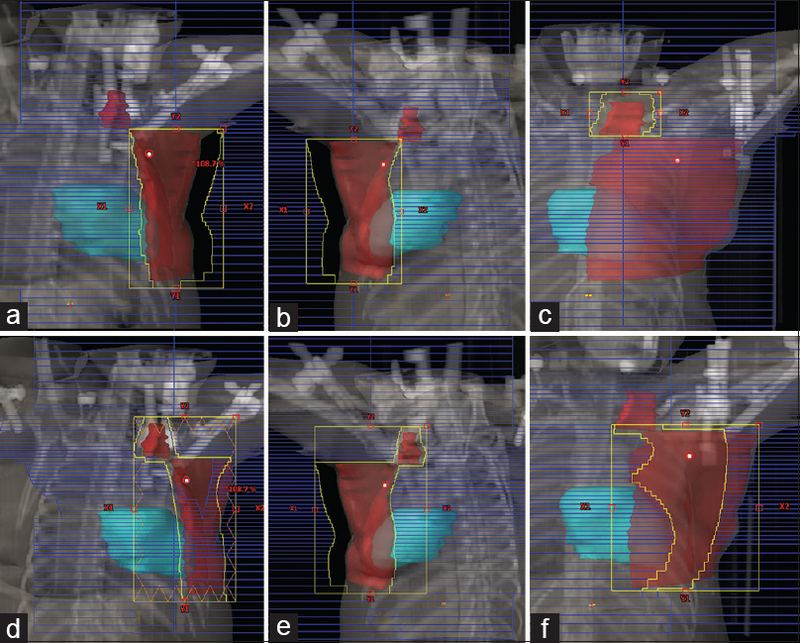 A comprehensive clinical 3-dimensional dosimetric analysis of forward planned IMRT and conventional wedge planned techniques for intact breast radiotherapy. Med Dosim 2008;33:62-70. Lee JW, Hong S, Choi KS, Kim YL, Park BM, Chung JB, et al. Performance evaluation of field-in-field technique for tangential breast irradiation. Jpn J Clin Oncol 2008;38:158-63. Morganti AG, Cilla S, de Gaetano A, Panunzi S, Digesù C, Macchia G, et al. Forward planned intensity modulated radiotherapy (IMRT) for whole breast postoperative radiotherapy. Is it useful? when? J Appl Clin Med Phys 2011;12:3451. The International Commission on Radiation Units and Measurements (ICRU). Prescribing, Recording, and Reporting Photon-Beam Intensity-Modulated Radiation Therapy (IMRT). Vol. 10. 2010. p. 83. Al-Rahbi ZS, Ravichandran R, Binukumar JP, Davis CA, Satyapal N, Al-Mandhari Z. A dosimetric comparison of radiotherapy techniques in the treatment of carcinoma of breast. J Cancer Ther 2013;4:10-7. Al-Rahbi ZS, Al Mandhari Z, Ravichandran R, Al-Kindi F, Davis CA, Bhasi S, et al. Dosimetric comparison of intensity modulated radiotherapy isocentric field plans and field in field (FIF) forward plans in the treatment of breast cancer. J Med Phys Assoc Med Phys India 2013;38:22-9. Yavas G, Yavas C, Acar H. Paper: Dosimetric Comparison of Whole Breast Radiotherapy Using Field in Field and Conformal Radiotherapy Techniques in Early Stage Breast Cancer. Available from: http://www.en.journals.sid.ir/ViewPaper.aspx?ID=302057. [Last accessed on 2014 Nov 04]. Yeom MS, Bae SS, Kim DS, Back GM. Study on Computerized Treatment Plan of Field-in-Field Intensity Modulated Radiation Therapy and Conventional Radiation Therapy according to PBC Algorithm and AAA on Breast Cancer Tangential Beam; 2012. Available from: http://www.inis.iaea.org/Search/search.aspx?orig_q=RN: 44015279. [Last accessed on 2014 Nov 04]. Rongsriyam K, Rojpornpradit P, Lertbutsayanukul C, Sanghangthum T, Oonsiri S. Dosimetric study of inverse-planed intensity modulated, forward-planned intensity modulated and conventional tangential techniques in breast conserving radiotherapy. J Med Assoc Thai 2008;91:1571-82. Fournier-Bidoz N, Kirova YM, Campana F, Dendale R, Fourquet A. Simplified field-in-field technique for a large-scale implementation in breast radiation treatment. Med Dosim 2012;37:131-7. Balasingh ST, Singh IR, Rafic KM, Babu SE, Ravindran BP. Determination of dosimetric leaf gap using amorphous silicon electronic portal imaging device and its influence on intensity modulated radiotherapy dose delivery. J Med Phys Assoc Med Phys India 2015;40:129-35. Son J, Baek T, Lee B, Shin D, Park SY, Park J, et al. A comparison of the quality assurance of four dosimetric tools for intensity modulated radiation therapy. Radiol Oncol 2015;49:307-13.